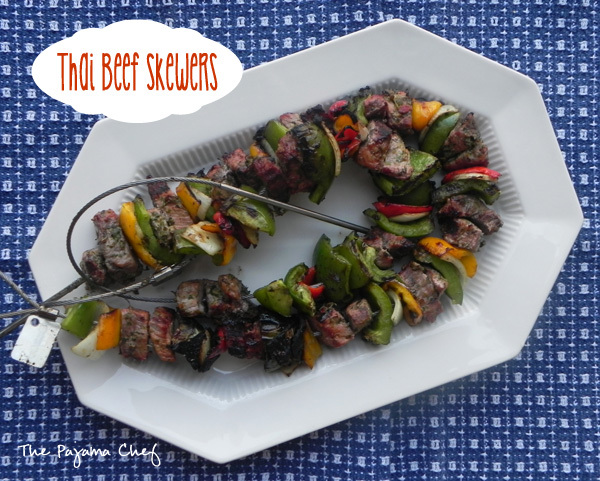 A Thai-inspired grilled beef skewer recipe that couldn’t be simpler but tastes amazing! So flavorful and exotic. Welcome to #10DaysofTailgate! Camilla did a great job organizing this fun event, and we have 14 amazing giveaways for you guys! So check out the giveaway here. 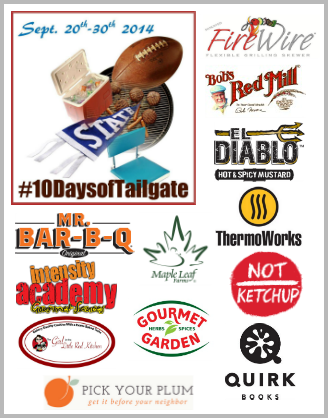 🙂 September is winding down, and so is #10DaysofTailgate and the giveaway so check it out now! Whenever Ben and I grill–correction: whenever BEN grills and I watch–we pretty much always have the same thing: burgers. Burgers. Burgers. Delicious, but boring. We have some skewers that came with our grill tools but we’ve never used them. 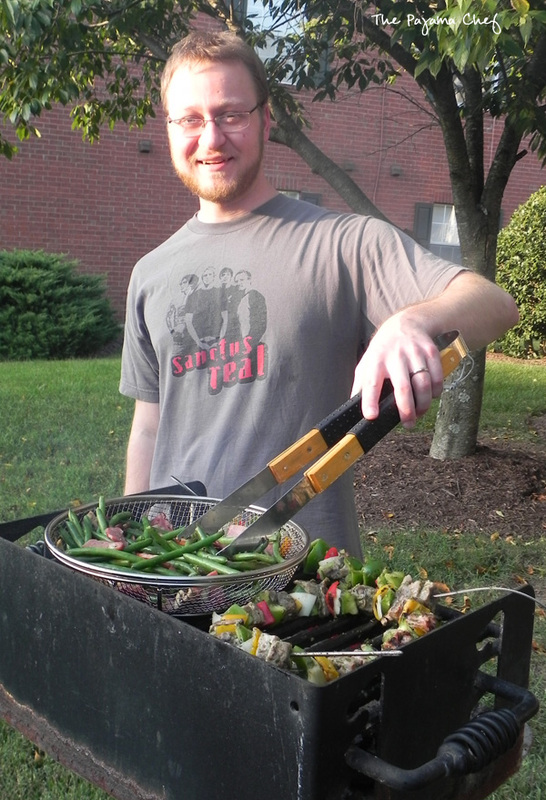 And we still haven’t even though we made skewers… because FireWire Grilling [check ’em out on Twitter and Facebook too] sent me some cool flexible skewers as part of #10DaysofTailgate. Thank you SO much! They are so fun to use, and easy to grill with, even on a small grill like the one we have at our apartment complex. The tips stay cool if you keep them off the grill so they’re easier to remove. 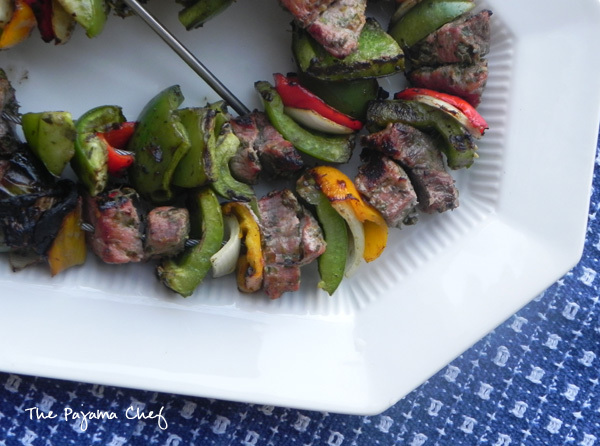 These skewers were SO flavorful and tender. I marinated chunks of steak in a mixture of Thai basil, rice vinegar, fish sauce, and two herbs that Gourmet Garden sent as part of #10DaysofTailgate–lemongrass and chili pepper. This was my first time using those tubes of herbs and I have to say that they were super convenient, especially for something like lemongrass that you might not normally purchase. [If you want, check ’em out on Twitter, Facebook, and Pinterest.] While fresh herbs are definitely my first choice for seasonings, I’ll definitely consider Gourmet Garden in future! For my skewers, I added bell peppers and onions to the beef but feel free to use whatever veggies you like. 🙂 Next time I make these skewers I’d love to add fresh mango or pineapple AND use coconut milk in the marinade instead of water. I highly suggest YOU try those additions. 🙂 Enjoy! Combine basil, water, oil, vinegar, Lemongrass paste, Chili Pepper paste, and fish sauce in a large bowl. Use immersion blender to process until smooth. A regular blender or food processor would work as well. Add steak cubes to the mixture, stirring to fully submerge. Cover and refrigerate for 4 hours to marinate. After marination is complete, add steak to skewers along with bell peppers and onions. Grill over indirect heat to desired doneness, about 15-20 minutes on a charcoal grill. If you don’t have a grill, you can try baking the skewers on a rimmed baking sheet at 375 degrees F for 20-30 minutes, turning every 5 minutes. Just follow proper safety precautions such as soaking wooden skewers for 24 hours to prevent the risk of fire. I have not tried baking these, but there are lots of tutorials online on this subject. Disclosure: I received a complementary set of flexible grilling skewers from Firefire and complementary herbs from Gourmet Garden Herbs and Spices as part of my participation in #10DaysofTailgate. I was not compensated in any way–for my time, to create a recipe, or to publish positive comments. I was not required to use these products as part of my recipe. My opinions are my own. Those skewers look DELICIOUS! I can’t wait until we can grill again. I’ll be making these when we can grill. Thank you, Christie! They were so good! These look amazing! I posted skewers today, too. But I have yet to use that skillet. Soon. Thanks for sharing with #10DaysofTailgate. Wow! the flavors in your marinade make these beef skewers special, and the coconut milk variation gets my vote. I’m tempted to hold back a 1/4 cupful and baste the veggies while grilling – just spreading the love. thanks! i thought about doing that but chose not, and was actually glad i didn’t. they did have some extra flavor but still tasted like veggies. i prefer veggies to taste like they’re supposed to without tons of seasoning. Wow!! These look so good! So healthy, nutritious and oh-so delicious!! 🙂 YUM!! I love kabobs. They are such a great complete meal and your recipe sounds like a must try to me. thanks, aimee! chicken would work great! thanks, terra! we want to use ours often too! Everyone’s skewers looks so great! Yes, i know!! it’s too bad we couldn’t have a REAL tailgate party in person to enjoy all this deliciousness!